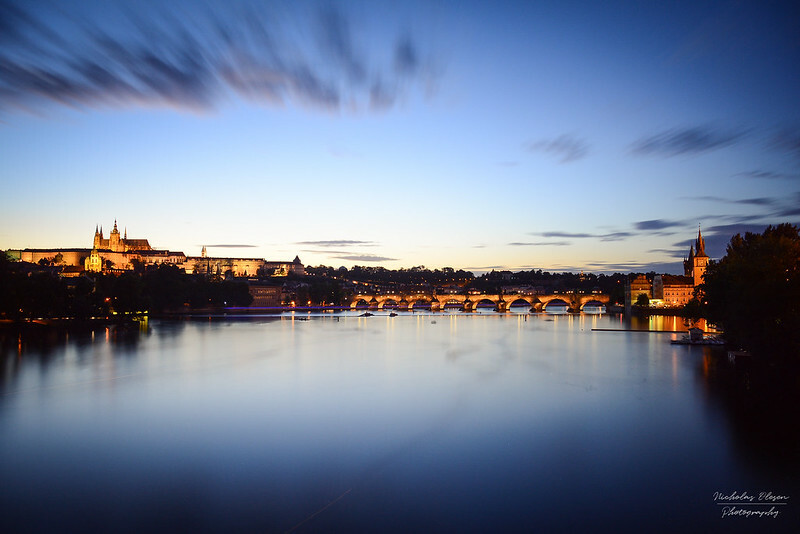 A view of Prague’s skyline – shot from one of the bridges crossing the Vltava River, looking towards Charles Bridge and Prague Castle. Taken at blue hour using a Hoya NDX400 filter and a 3 minute exposure. 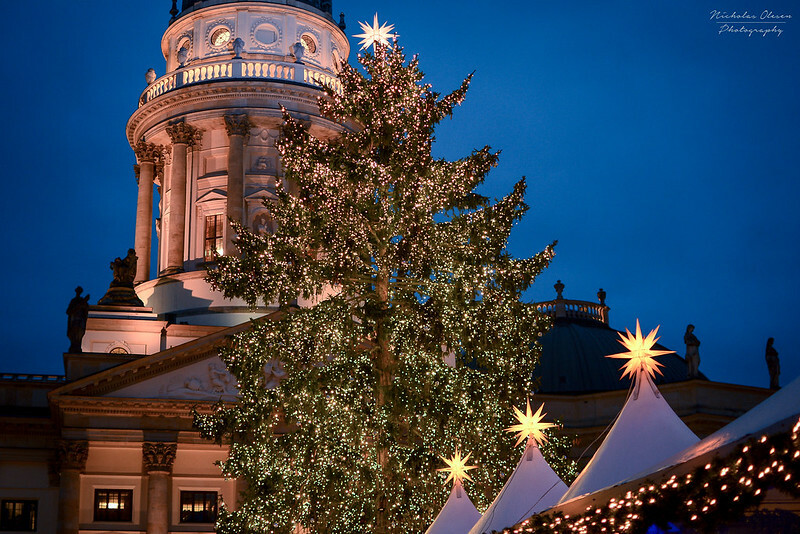 While most of Europe has been blanketed in snow this week, Berlin has managed (for once in winter) to stay sunny – but it’s misleading since temperatures have dropped to as low as -13C at night with highs of -5C or -6C during the day! 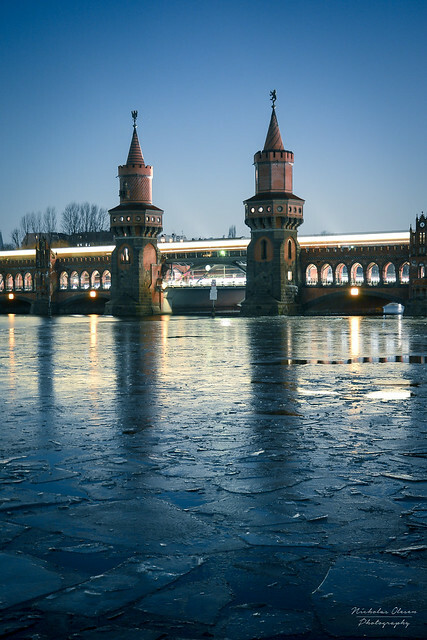 Whenever there are several consecutive days of sub-zero temperatures, chunks of ice collect on the river Spree upstream of the Oberbaumbrücke in Eastern Berlin, as shown here shot earlier today during blue hour. 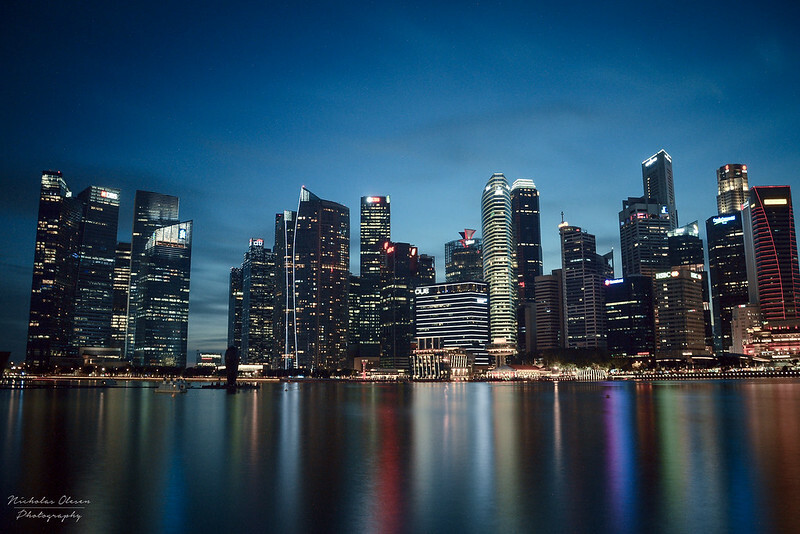 At the end of our trip to Indonesia, we spent a few days visiting Singapore. 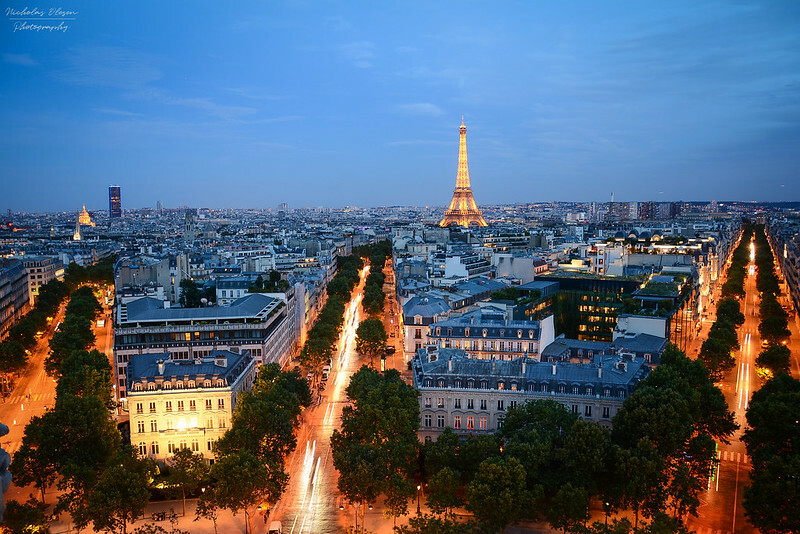 It’s a modern city, but with a fascinating mix of cultures and a rich history. This is a view of the downtown skyline, shot at blue hour with a Hoyda NDX400 filter. This is a view of Mt. 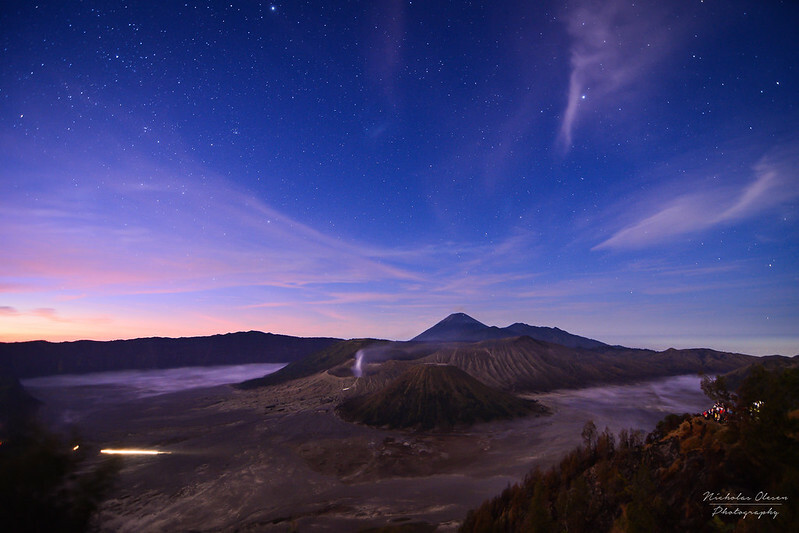 Bromo, on Java in Indonesia, as the sunlight begins to filter over the horizon. This shot was taken just a few minutes after my previous one (see the comments section below), and the stars are already a lot less visible. I really liked the contrast between the deep blue sky and the foreground colors – not long after this the sky and clouds developed a lot more pink and orange. I just got back from a long trip through Indonesia – covering Java, Bali, Lombok and Flores. One of the (many) highlights was watching the sunrise over Mt. Bromo, on the island of Java. We arrived at the popular viewing point around 3am, and were the first people there, which meant we were able to get the best spots. We just had to wait in the cold wind until 4:30am for the sun to show itself! While we waited, I took some long exposure shots to catch the vast array of starts visible above the volcanoes. On the plain in front of Mt. Bromo you can see the light trail left behind by the jeeps taking visitors to other viewing points. 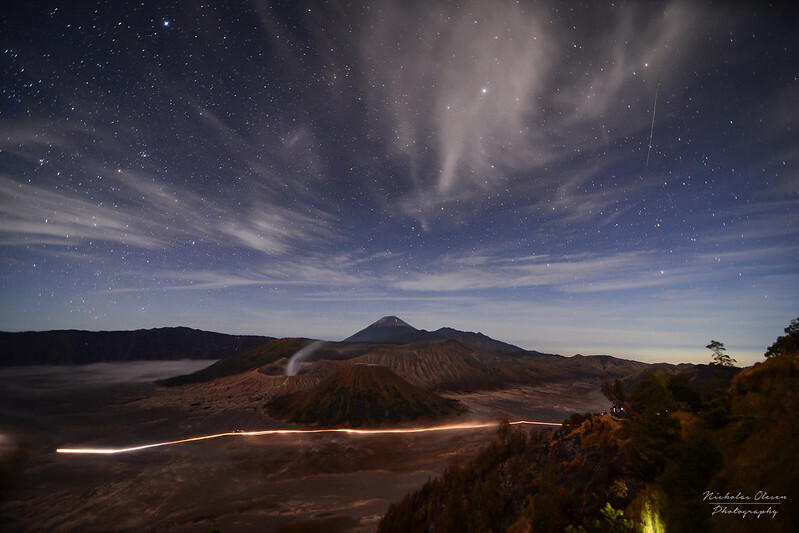 And then I got lucky – during one of my long exposures, a shooting star suddenly appeared over the volcano!